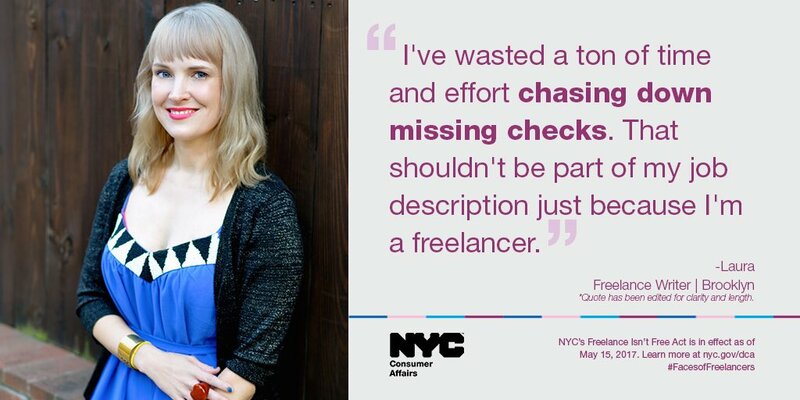 Those who freelance in New York City now have more legal rights and can learn how to utilize them. On May 15th, 2017, Local Law 140 took effect which establishes and enhances protection for freelance workers in New York City. The Mayor’s Office of Labor Policy and Standards (OLPS) has planned events to educate those involved and effected by the new law. According to a 2015 report from the Freelancers Union, 71% of freelancers report problems with receiving payment. The report also concluded that late and nonpayment is a top challenge facing freelancers in America, who are one third of the U.S. workforce. 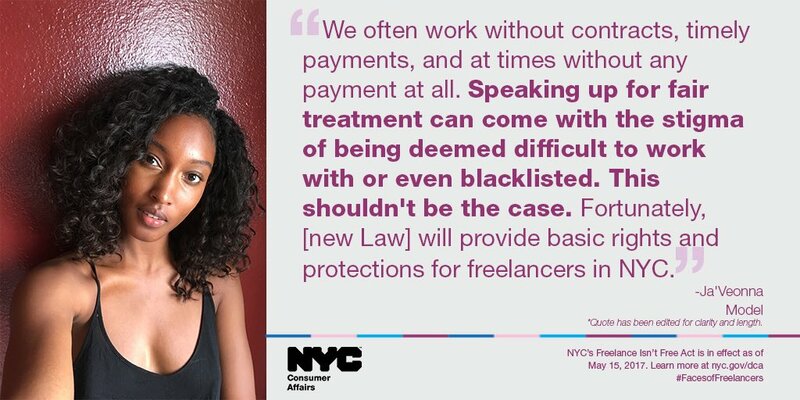 The Faces of Freelancers campaign brings to light the true problems freelancers face and show law makers why Local Law 140 is important to New York City. Local Law 140 requires contracts for freelance work over $800 or more to be in writing, prohibits late pay or underpay, and protects freelance workers against retaliation for asserting their rights under the law. There are penalties for violations of these rights, especially if there is evidence of a pattern or practice of the violations. The law also requires the OLPS to receive complaints, create a court navigation program, and gather data to report on the effectiveness of the law. Under the law, a freelance worker is any individual hired or retained as an independent contractor by a hiring party to provide services for compensation, which do include incorporated workers or those that use a trade name. Some exceptions that are not covered by the law are freelance workers hired as employees, those who agree to work for no pay, hired by any government, or are licensed medical professionals. The Model Alliance, a volunteer-run advocacy group for American models working in the fashion industry, is hosting an event with OLPS on Thursday, June 8th from 7-9 pm to educate fashion creatives in their rights under Local Law 140. Many models, hairdressers, make-up artists, stylists, and photographers freelance in the fashion industry and they share similar freelancing experiences. OLPS also hosts webinars to educate those involved on the law as well. On June 15th, there are two webinars to help freelance workers, those who hire freelancers, and both parties’ representatives to understand their rights and responsibilities. You can click here to sign up for the webinar. For more information on the law, click here for New York City’s guide on the law.